In news that is totally non-heinous and most excellent, the long-awaited third installment in the Bill & Ted movie series is officially underway. 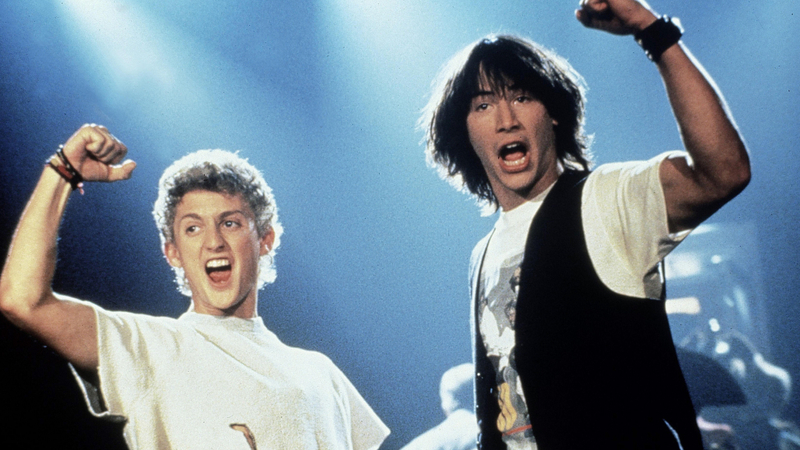 The film, entitled Bill & Ted Face the Music, will feature stars Keanu Reeves and Alex Winter returning to their iconic roles from 1989’s Bill & Ted’s Excellent Adventure and 1991’s Bill & Ted’s Bogus Journey. Bill & Ted franchise creators Chris Matheson and Ed Solomon, who penned the previous films in the series, have already completed the script. Set to direct is Dean Parisot of Galaxy Quest fame, and Steven Soderbergh (director of the Ocean’s Eleven trilogy) is among the executive producers. “We couldn’t be more excited to get the whole band back together again. Chris and Ed wrote an amazing script, and with Dean at the helm we’ve got a dream team!” Reeves and Winter told The Hollywood Reporter. “We’re tuning the air guitars!” Winter added on Twitter.